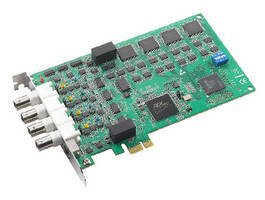 Analog Data Acquisition Card features PCI Express interface. Featuring multiple trigger modes, 12-bit Model PCIe-1744 achieves sampling rate of 30 MHz with independent analog-to-digital converters for each of 4 analog input channels. Large sample FIFO buffers per channel help ensure all readings are securely captured. Typical applications include automatic test equipment, quality control, and factory production. (Cincinnati, Ohio) - The Industrial Automation Group of Advantech introduces the PCIe-1744 4-channel, 12-bit, ultra high-speed analog data acquisition card with PCI express interface. The PCIe-1744 is capable of handling analog-to-digital sampling simultaneously and independently on all four channels. The PCIe-1744 features multiple trigger modes for convenient application scenarios and a 30MHz sampling rate is achieved with independent A/D converters for each of the four analog input channels. Large sample FIFO buffers per channel help ensure all readings are securely captured. PCIe, unlike previous PC expansion standards, are structured around point-to-point serial links, a pair of which (one in each direction) make up a lane; rather than a shared parallel bus. These lanes are routed by a hub on the main-board acting as a crossbar switch. This dynamic point-to-point behavior allows more than one pair of devices to communicate with each other at the same time. In contrast, older PC interfaces had all devices permanently wired to the same bus; therefore, only one device could send information at a time. This format also allows channel grouping, where multiple lanes are bonded to a single device pair in order to provide higher bandwidth. The PCIe-1744 is targeted at applications requiring high sampling rate, such as automatic test equipment, quality control, factory production, and so on. For more information or to purchase, please contact Advantech directly at 1-800-205-7940 or your regional Advantech authorized distributor.